If it’s time for Republicans and Democrats to get along to avoid the fiscal cliff, maybe bicyclists and motorists should be working together as well. Large US cities continue to achieve bicycle friendly status from the League of American Bicyclists as Los Angeles, Nashville and Miami received the honor this week. The latest round comprised 26 cities that entered the list — 23 at the lowest level (bronze) and three at the next higher level, silver. 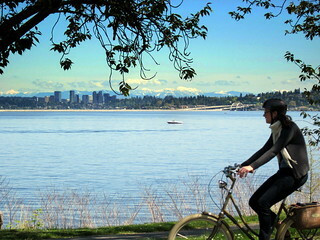 In all, the League has named 242 cities in 48 states as bicycle-friendly communities. See bicycle-friendly community map. Washington remains the most bicycle friendly state in the nation for the fifth year in a row, according to an appraisal by the League of American Bicyclists released Tuesday. The state earned a score of 4 out of 5 in the categories of Legal, Policies and Infrastructure, and a perfect 5 in Education and Evaluation.